In the 1920s and 1930s, Art Deco was the popular choice for elegant, modern interior design. With its clean, streamlined shapes, geometric patterns and smooth finishes, the style was a deliberate departure from heavy, ornate Victorian-era furnishings. Echoing the spirit of jazz, Machine Age technologies, and a post-war society looking to the future, Art Deco offered a glamorous style for a new era. Thanks in part to the new movie adaptation of The Great Gatsby, the Art Deco influence is experiencing a resurgence. If you’re aiming to bring this distinctive look to your décor, choose furniture with strong sweeping lines. 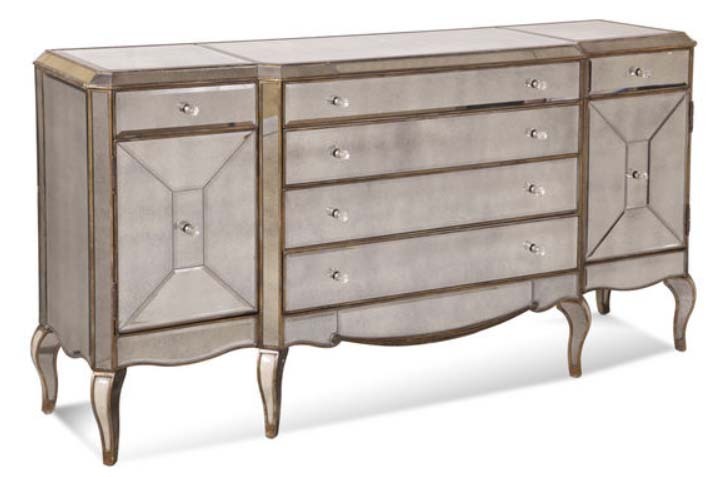 Large scale pieces were used to add drama, so feel free to go big with an armoire, sideboard, or oversized chair. Art Deco style furnishings made use of materials which were new at the time, such as chrome, stainless steel, and lacquered wood. Mirrors were a big accessory, providing some of the shine and sparkle associated with Art Deco. Mirrored furniture was considered a glamorous addition, so a mirrored coffee table, dresser or buffet would make a glitzy focal point in your room. And for entertaining in 1920s fashion, what home would be complete without a bar or a chrome and glass cocktail cart. Art Deco replaced Art Nouveau’s intricate flowing lines with angles and clean shapes. It emphasized form and symmetry, incorporating patterns such as zig-zags, chevrons, sunbursts, and elongated shapes reminiscent of skyscrapers. In your home, a touch of this streamlined aesthetic can be reflected in the lines of a fan-shaped dresser mirror, a rug with a geometric design, or a linear patterned wallpaper on an accent wall. Glossy black, gold, chrome, silver, white, red, and yellow are the most popular colors of the Art Deco style. Black and chrome were thought to reflect the current technological advances, so the combination was used often. Black and white was also a common pairing – a classic choice for a tiled floor. On the other end of the palette, neutrals like beige and cream contrast nicely with dark lacquered wood furniture, particularly in a sumptuous bedroom setting. Mood is everything for Art Deco interiors, and layered lighting can create the right atmosphere. A wall sconce or torchiere floor lamp offers flattering indirect lighting. Lamp bases of bronze or wrought iron are typical, with clear, frosted or colorful glass shades. A lamp with a futuristic shape is a perfect accent in an ultra-modern Art Deco décor, and if you can’t resist Hollywood glamor, a sparkling chandelier will add the shimmer you’re looking for. While the Art Deco style tends to feature smooth surfaces, rich materials and textures keep them from looking plain. Veneers and inlaid wood provide depth and design to wooden pieces. Velvet upholstery brings a sensuous quality to solid, neutral-colored fabrics. Avoid using floral prints or plaids with this style, but if you’d like to add a bold statement, stick with repeating, symmetrical patterns. Zebra print is another Deco-appropriate option, thanks to the rise in travel in the 1920s and 30s, when African safaris became all the rage. For a Tropical Deco twist, try a palm tree print and a pastel color scheme to echo the feel of Miami Beach’s Art Deco district. Art Deco’s sleek style fits in well with most of today’s interiors, and retains its timeless appeal. With its forward-looking approach to style, hopefully Art Deco elegance will continue to inspire generations.